If you’ve been following me on Snapchat, Twitter, and Instagram, you’ll have seen me posting about my Sailor Pluto cosplay! 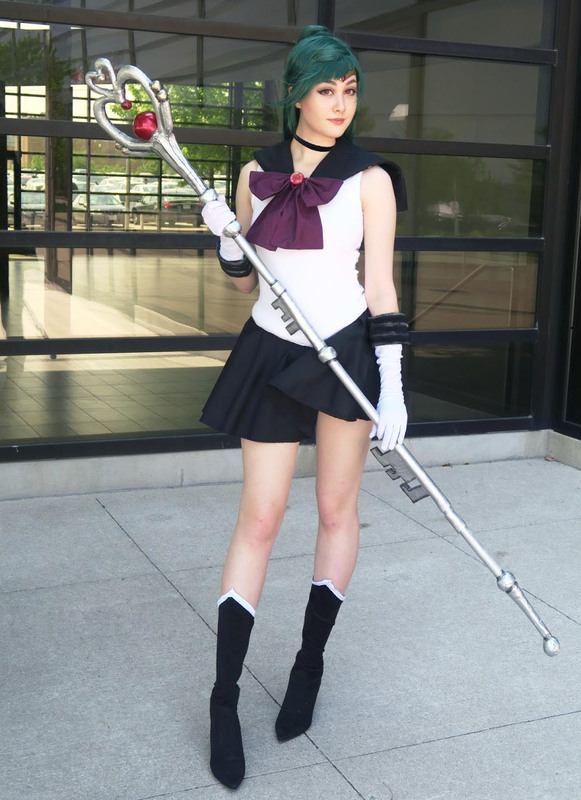 Sailor Pluto is my third (and probably last) Sailor Scout cosplay, following Sailor Jupiter and Mars. I wanted to go out with a bang, featuring a large prop! I decided to document the creation of her ‘Time Key’ staff. This will be a photo tutorial of my…. This tutorial was made possible by my Patreon supporters! Your support allows me to invest more time in creating cosplay tutorials / videos. Thanks again. Now, on to the tutorial! The overall design is quite basic, but has a pretty cool looking final product. As I mentioned in the video, this tutorial can be modified for any basic cosplay staff/prop design! Wooden dowel – The one I used was about 5ft long and 1-inch thick. Craft Foam – thin sheets you can find at most craft stores or dollar stores. Xacto Knife or foam cutting knife. Various grit sand paper – Thick grit will sand a shape down more quickly, whereas thin grits are better for smoothing. Spackling – I used Drydex – it’s a thick pink paste used to fix cracks in walls, but dries white and is easily sanded. Christmas Ornament – I used this for the red orb part of her staff. Wood Glue or gesso for priming. 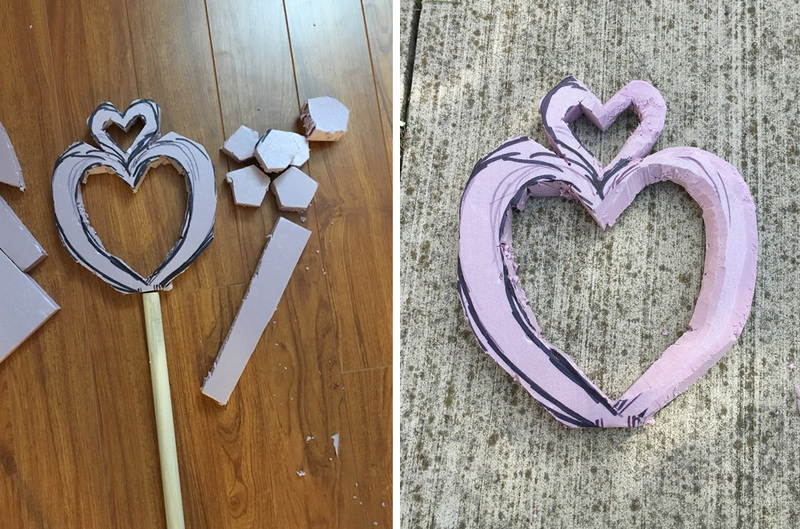 Worbla – optional, I used my leftover scraps but it can easily be substituted. My early staff sketch and rough cut. I didn’t end up using this version because it was too big and wide, but I did the same thing for my current version. I’m using pink insulation foam board (you can find it at home depot!) and 3 very sharp cutting knives of different sizes! A thick one for base cuts, a medium one for shaving, and a thin small one for details and small edges like the top heart. 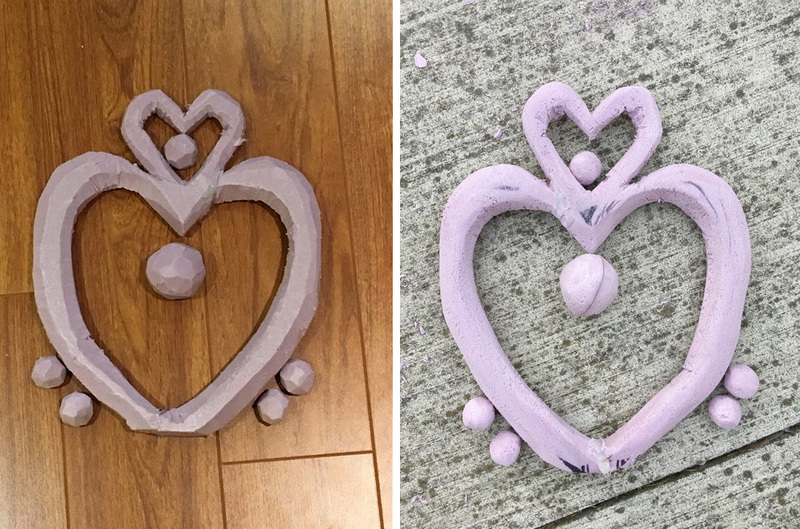 Half of the heart shaved down into a rounded shape, which makes it easier to sand and round out later on. Once you have rough cut the staff shape, you can begin to sand. Some advice: apply a hard top coat of clear polish to your nails if they are bare, it’ll stop them from chipping/peeling from the abrasive sanding motions. Rough cut pieces / half rounded. Other side of the half rounded / fully rough cut rounded. 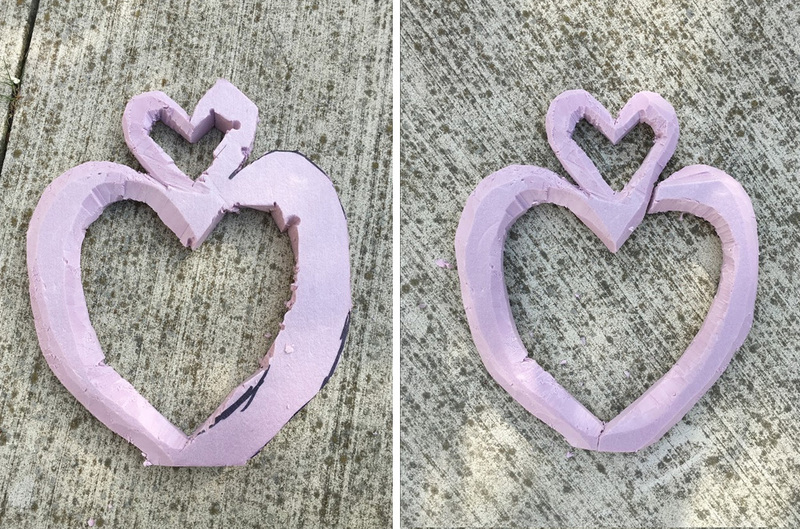 After looking at the reference again, I realized my heart was a little too long (vertically), so I cut out a 1 inch chunk on each side of the heart so it’s a bit thicker and wider. I also glued two of the little orbs on the top dips of the hearts. 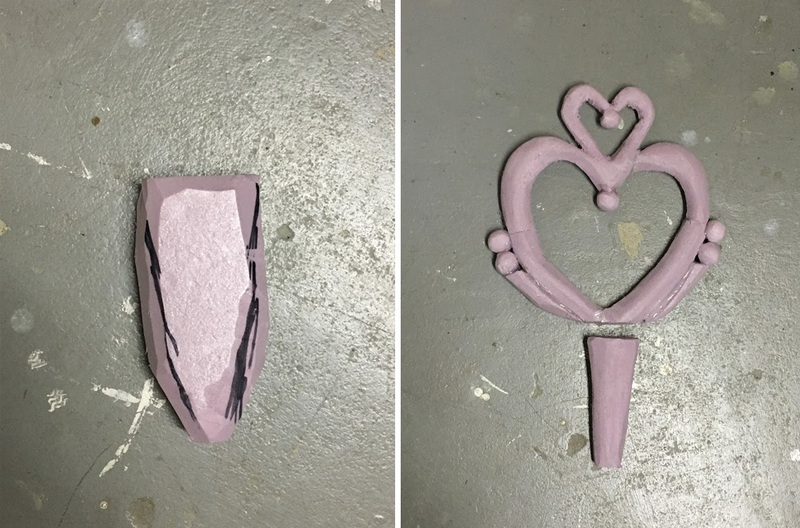 Carved out a base of the heart shape of the staff, and sanded it down. I later added a rounded design cut from craft foam on top. 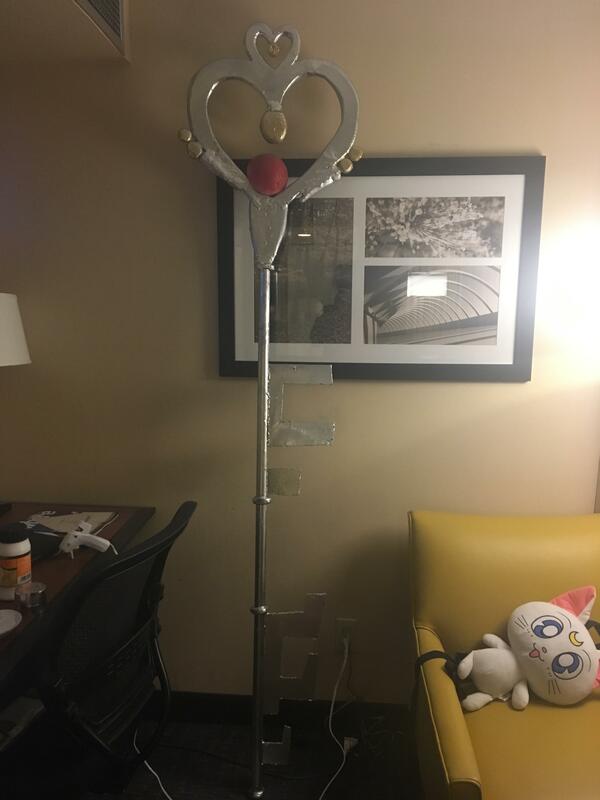 I also hot glued the little balls/orbs onto the staff. Reinforced and covered up any cracks / glue lines with spackling! It’s the drywall stuff that you put over cracks in walls. The brand that I used (Drydex) is from Home Depot and costs like $3, and it has a really handy feature where it’s pink when it’s wet, and when it’s completely dry it turns white! It’s very easy to sand down, and very powdery! So make sure you’re wearing clothes you don’t mind getting dirty. Tip: When sanding the Drydex, go with a medium or thin grit sandpaper. A thick/rough grit will pull away at the spackling and most of it will likely fall off. Craft foam (the blue parts) were glued on to create the raised parts of the staff. Scrap worbla was heated and formed into rolls which were wrapped around the staff to create the circular raised parts. Strips of worbla were wrapped around the foam parts for reinforcement. After spackling, I cut out foam strips and glued them onto the base to give them that scalloped design. I covered up the gaps with spackling and sanded it down. 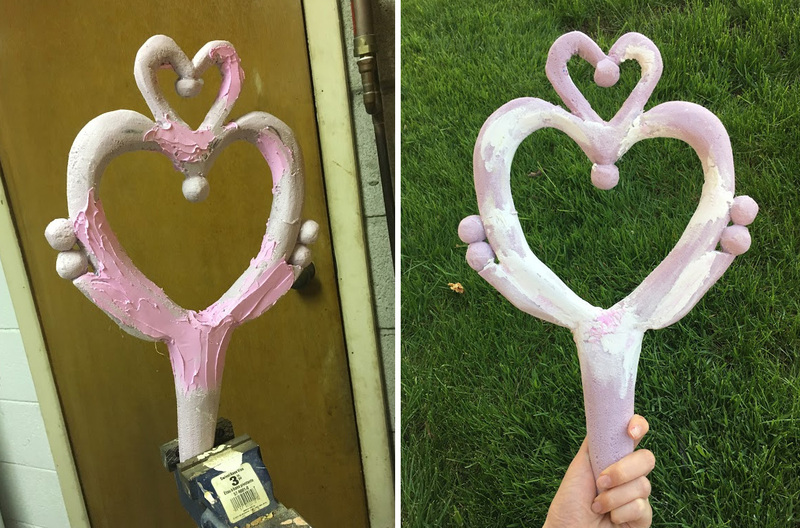 I also carved the bottom of the staff (the piece that looks like an exclamation point,) and followed the same process as before. Don’t worry if you find little glue globs or lumps – there are two methods to fix this for an overall smooth design. Wait until the glue is about 75% dry. Use a bit of warm water and massage the glue where there are any lumps/drips to smooth them out. Then let it completely dry. Wait until the glue is completely dry and simply slice off the drips with a sharp cutting knife. Follow with another thin paint of glue to smooth it over. About 10000 layers of glue later, my staff head has now turned yellow. Thanks wood glue! Now that these parts were ready, I mounted them on the staff body with hot glue. I didn’t manage to get detailed photos during the painting process, so here’s a video screengrab! I used silver spray paint (Krylon Metallics) for the base coat – I did about 3-4 coats on each side! I took some black acrylic paint and painted the edges and crevices of the staff to create dimension. I highly recomment weathering your weapons with dark and light paint to create the illusion of light and shadows… The effects look really cool in photos! Tip: Make sure to spray paint about a foot away from your prop – if you spray too closely, the paint will pool and begin to drip. Pretty simple, if I do say so myself! 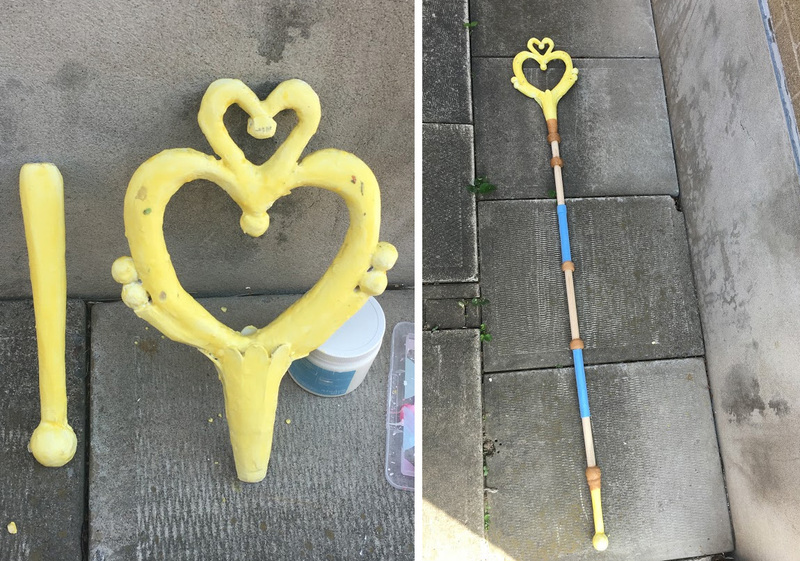 The staff stayed together for most of the weekend – the only little conflict I face was that my cousin accidentally stepped on the end of my staff and the foam part cracked off, but that was easily hot glued back together! You wouldn’t have noticed it at all in person! 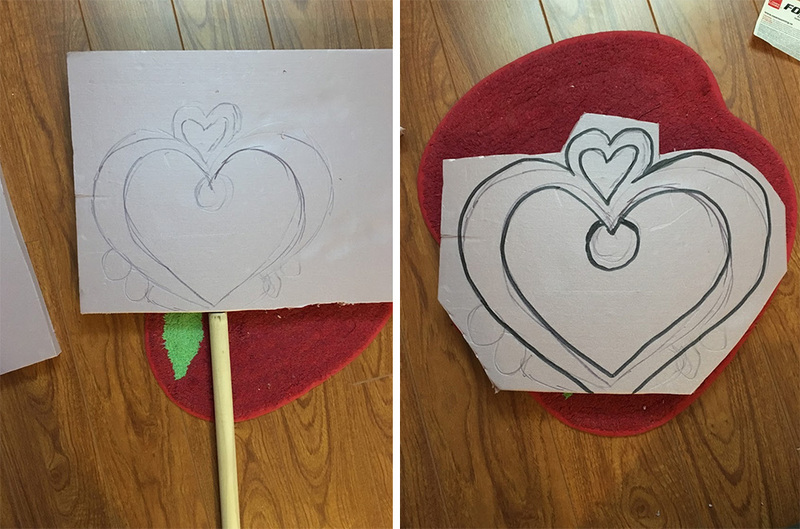 As I mentioned before, this is a super easy way to make a cosplay staff – I’ve used it for most of my cosplay props. 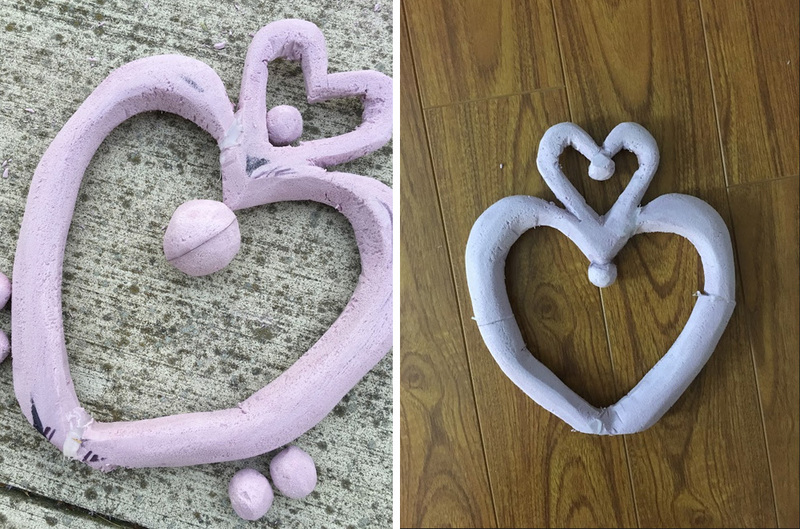 Insulation foam, craft foam, and worbla are wonderful materials to use for props! 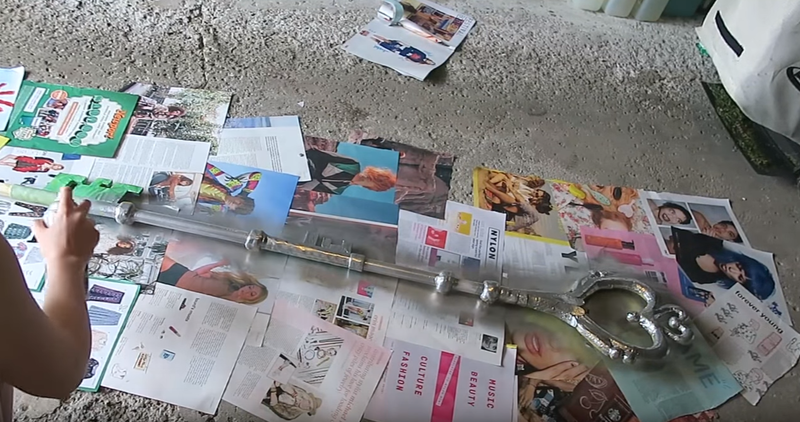 Make sure to check out the Cosplay Staff Tutorial video if you haven’t already! 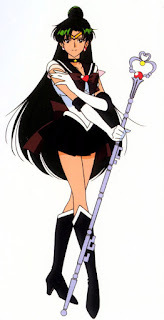 I appreciate this tutorial I am going to be sailor pluto for Otakon and was like omg I don’t want to pay a lot for her staff! So I looked up how to make it and this here helped a whole lot! It was a lot of fun of course after four foams and one dowel later for me LoLz I made my time key and it was amazing! I simply found a pair of cheap faux suede boots at the thrift store, cut the top of the boot shape so it had a point, and glued some white bias tape a long the edge. Way easier than making boot covers.